Dikran Khan Kelekian, Paris and New York (circa 1921); sale, American Art Galleries, New York, 30-31 January 1932, lot 31. Mrs. Cornelius J. Sullivan, New York (circa 1937); sale, Parke-Bernet Galleries, Inc., New York, 6-7 December, 1939, lot 156 (illustrated). Walter P. Chrysler, Jr., New York; sale, Sotheby's, London, 21 April 1971, lot 10. Mrs. A. Elisabeth Hahn, Los Angeles. L. Venturi, Czanne, son art-son oeuvre, Paris, 1936, vol. I, p. 281, no. 1122; vol. II, pl. 323 (illustrated; dated 1883-1887). M. Raynal, Czanne, Paris, 1936, p. 139, pl. CIII (illustrated). J. Rewald, Paul Czanne, the Watercolors, a Catalogue Raisonn, New York, 1983, p. 136, no. 214 (illustrated; dated circa 1885). Brooklyn, Museum of Art, Paintings by Modern French Masters, 1921, no. 26. Springfield, Museum of Fine Arts, Opening Exhibition, October-November 1933, no. 104. San Francisco, Museum of Art, Paul Czanne: Exhibition of Paintings, Watercolors, Drawings and Prints, September-October 1937, no. 40 (illustrated). Richmond, The Virginia Museum of Fine Arts, and Philadelphia, Museum of Art, Collection of Walter P. Chrysler, Jr., January-May 1941, no. 33 (illustrated). Provincetown, Massachussetts, Chrysler Art Museum, and Ottawa, The National Gallery of Canada, The Controversial Century 1850-1950, Paintings from the Collection of Walter P. Chrysler, Jr., summer-fall 1962. Tokyo, National Museum of Western Art; Kyoto, Municipal Museum, and Fukuoka, Cultural Center, Czanne, March-May 1974, no. 69 (illustrated). The present work is one of a series of studies of a geranium plant in a pot that Czanne painted circa 1885 (Rewald, nos. 211-213). 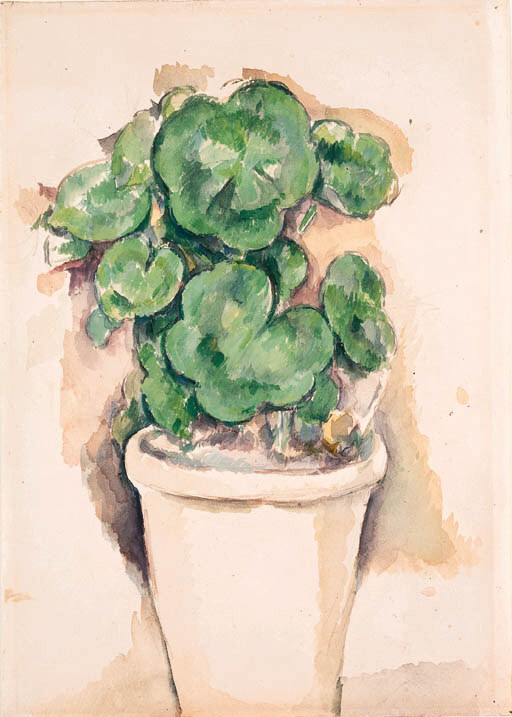 Adrien Chappuis has noted that Czanne's choice of a subject was perhaps a fitting symbol of the artist's own tenacity; the hardy green leaves of the plant were resistant to the ravages of winter, and the multiplicity of their plain, rounded forms reflect an irrepressible earthy abundance. With its verdant fullness of color and its centralized composition, seen close-up, the present work projects a direct matter-of-factness that transforms an ordinary subject into a heroic statement of determination and will.